A brass and reed band has been an integral part of the Loyal Edmonton Regiment throughout its history. Today it is one of the two Primary Army Reserve bands in 41 Canadian Brigade Group and services the Central and Northern Alberta area. The band appears primarily as a concert and parade band which provides music for military, veteran and state functions as well as public performances throughout the year. The band currently consists of both active Reserve Force members and a few volunteer members. Reservists commit to join and train on a part-time basis with the Canadian Forces. Our volunteers are generally retired military members who donate their time and skills for the opportunity to perform with a high quality band in a variety of settings. The band is comprised of players of various ages and skill levels from recent high school graduates to university players, hobby players, semi-professional and professional musicians. We encourage anyone wishing to join the band to come and sit in for a couple of rehearsals. This will give the perspective members a chance to decide if the band is a good fit for them. Upon deciding to join the band, we will book an appointment with the Director to further evaluate your skills and get you started on your paperwork. The band has paid rehearsals weekly, and performs throughout the year when requested. There are several opportunities for summer employment varying from one week to four months in length. Employment could include membership in the Band of the Ceremonial Guard on Parliament Hill in Ottawa or training at the CF Music Training School at CFB Borden near Barrie, Ontario. 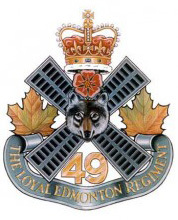 Visit the The Loyal Edmonton Regiment Band website or Musician on the the Canadian Forces site. Be sure to look at the Part-time Option tab.